Well knitting friends, Sock Summit has come and gone for a second time. Good times were had by all, though I can attest that about 99% of us were pretty much saturated by Sunday. I think a naptime section of the Oregon Convention Centre would go over big. Maybe just a few sleeping mats and pillows in 20 minute spurts, you know? To let the knowledge sink in and the fatigue pass for a few minutes. But all in all, I think the fatigue is okay when you know you’ve been doing lots of mingling and learning and knitting and thinking, and this was a pretty awesome event. Steph and Tina and all the ST-1 and ST-2 team members deserve all the adulation in the world. It was bigger than the first time around but no less significant, and I am always impressed at how easy it is to “run into” knitters you know even when you are in such a big group. There were knitters all over the airport and on my flight to San Francisco (I am carrying on the vacation a few more days, taking the liberty while I’m already on the west coast), and it turned out that I spent the end of my Sock Summit trip much the same way it began – in an airport with Sandi Wiseheart. We knitted and chatted about our classes and thought about Knitting and Related Plans, and it was good. Sometimes I think events like this are the best purely for the non-event times, because when else do you get thrown in the path of knitters at such regular and like-minded intervals? 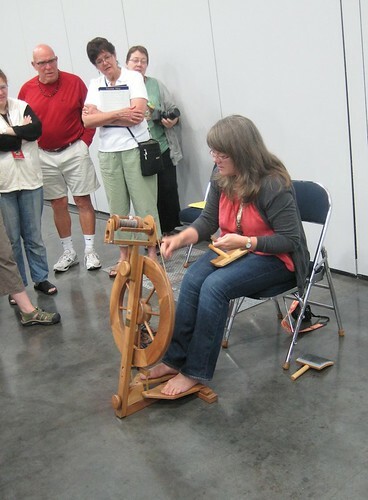 On the last day of Sock Summit I attended a lecture with Fiona Ellis, and spent the rest of the day mingling around the marketplace, and getting to do two things I didn’t do last time at Sock Summit. 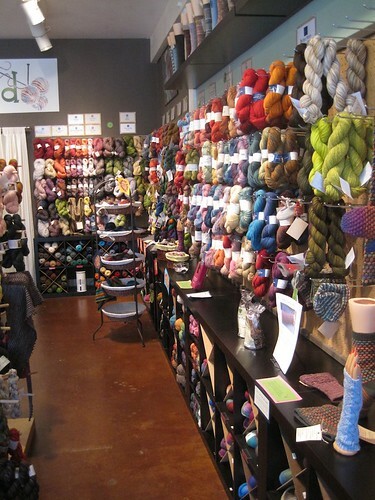 One was to visit an actual real live yarn shop in Portland (you know, actually leaving the marketplace at the convention centre and going to a store. Whoa, man. Michele (thanks, Michele!) offered to drive me to her spot which is Twisted – and it is indeed an awesome shop. These are all swatches knitted by folks at the shop, all with the exact same needle size, yarn, number of stitches and rows, and the same swatch style (flat, with garter at the edges). And you know what? Not only did none of them achieved the exact gauge written on the ball band, but none of them had the same gauge as another person in the group. 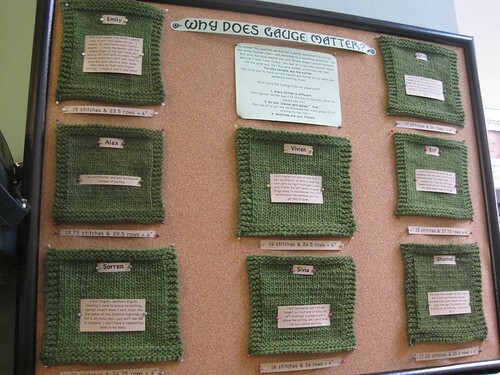 Maybe two of them had the same stitch gauge, but differed in row gauge, or vice versa. It was great. 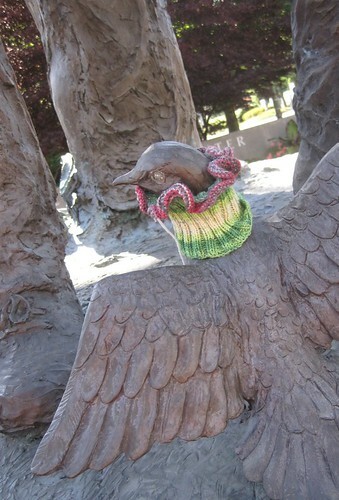 This is why gauge swatching can be so powerful, my knitting friends. The other thing that happened on Sunday is something that was new this time at Sock Summit, which was the ‘Fleece to Foot’ competition. 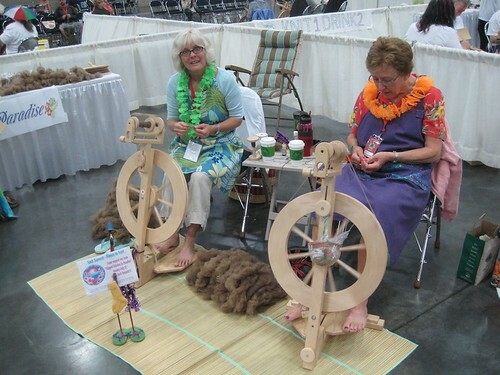 Six teams of spinners and knitters worked from freshly-shorn fleece to produce as much as possible of a pair of handspun and handknit socks. And that fleece, it was as fresh as you could get. The nervous young sheep waited amongst the camera happy knitters, then protestingly but cooperatively sat for their public shearings. 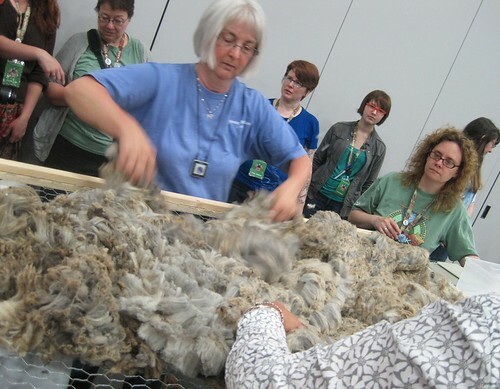 Then the fleece was sorted for the best locks and Clara Parkes (yes that Clara Parkes) took the first ones to card up and spin as a sample guideline for the spinning teams, who then worked for the next five hours as furiously as possible. I missed seeing the completion of the competition, but it was pretty great to watch in the early stages. Although I have now left Portland I have the rest of the week in San Francisco to look forward to – likely a combination of tourism and leisureliness, and more eating and visiting with knitters. Here’s hoping all of that goes according to plan. Have a great week ahead! Catch you next time from The City. Thanks for your reporting of SS11. It sounds as if an awesome time was had by all and you helped to bring it to those who weren’t able to attend. Enjoy the rest of your trip to the West Coast. I was hoping to have a chance to meet you. Looked for you but no luck..maybe next summit. 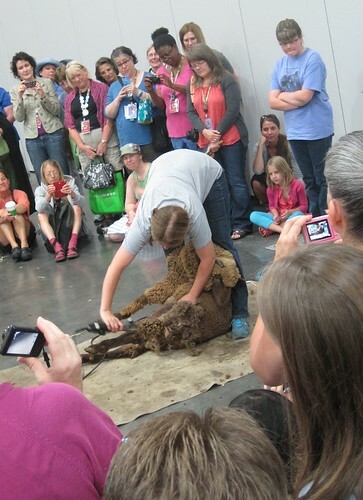 I have to admit that the photo of the poor sheep being sheared on a convention centre floor, surrounded by all those people makes me a little sad for the beast. Looks like a very lovely time! ooh, amazing!! what an incredible time. 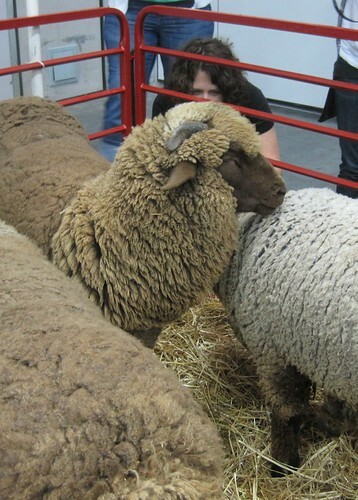 And although I know first hand sheep do not enjoy being sheared, it is very necessary for their health. I hope the rest of your vacation is as great as the first bit! That looks like too much fun. If only it hadn’t been a direct conflict with my vacation I could have done both! Thanks again for posting from SS2011! 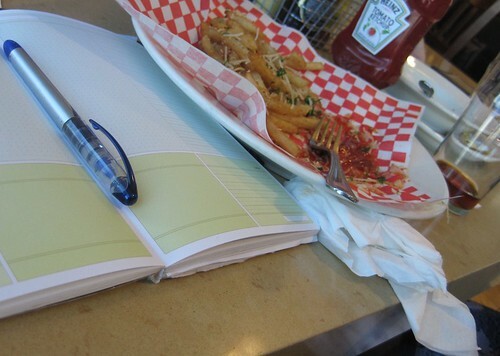 I’ve seen your notebook in at least two pictures; what kind is it? It looks wonderful for designing! Thanks for all the pictures. The last picture with the spinners spinning barefoot made me feel so much better, because that’s a preference of mine, and I didn’t know if it was just one of my quirky traits or if it’s a common thing. I just feel like I can feel my wheel so much better when I’m barefooted.